By Father James Wallace, C.Ss.R. Sunrise at San Alfonso Retreat House, Long Branch, N.J.
Another year has passed at San Alfonso Retreat House in Long Branch, N.J., and this year almost 12,000 came for a retreat or a day or evening of prayer. The theme of our 2017 retreat weekends was Walking in the Dark, Living in the Light, given by the San Alfonso Redemptorist preaching team: Fathers John Collins, John McGowan, Kevin O’Neil, and Jim Wallace and Sister Gerrie Muller, S.S.J. In addition to these weekend retreats, given to groups of women, men, and couples, we held other weekend retreats, including a dozen Matt Talbot retreats given by Father Gerry Chylko and Sister Bruni, Serenity retreats, a movie retreat, and an upcoming silent Advent guided-retreat weekend. But it is not just weekends that offer an opportunity for sustained prayer and reflection. At our beautiful site we also give weeklong and day retreats for religious sisters and priests, silent directed retreats, individual private retreats, a clergy institute, and retreat experiences for other groups. 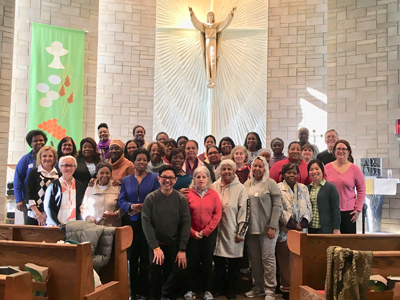 Three dozen women from Mission Church in Boston came for a retreat in November, accompanied by Fathers Philip Dabney and Thawee Cook Suwannasin. Our retreatants this year came not only from the East Coast and Southern states but also from as far away as Ohio, Illinois, California, and Hawaii. We frequently welcome retreatants from Redemptorist parishes. This year we were especially delighted to have a busload of 36 women come from OLPH Mission Church in Boston for the final women’s retreat in November, accompanied by parish priest and OLPH novena preacher Father Philip Dabney, C.Ss.R., and Father Thawee Cook Suwannasin, C.Ss.R., of Thailand, in residence at Mission Church while pursuing a doctorate. 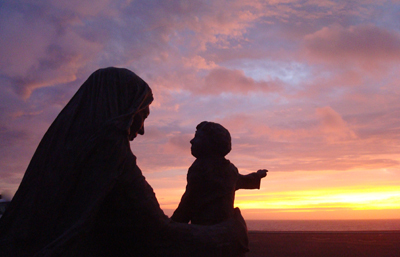 A retreatant captured this bronze statue of Mary and Jesus at sunset. Although we do offer a certain number of scholarships and partial discounts for those who cannot afford to pay our suggested stipend ($220 for a weekend), we would ask every Redemptorist parish or one or more organized groups in a parish or individuals who can afford to do so to (co-)sponsor a retreat. Next to the icon of Our Mother of Perpetual Help, the most beloved image of Mary at San Alfonso is a bronze statue near our prayer garden of Mary holding her infant son. 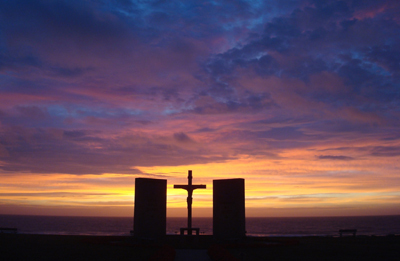 A retreatant captured its beauty at sunrise. Work has already begun on our team retreat for 2018 under the theme Living From the Heart. Weekends begin February 23-25. Click for a schedule of what 2018 has to offer. 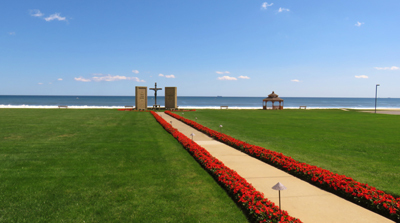 Begonias line the path to San Alfonso’s crucifix, flanked by brick panels bearing the text Into your hands I commend my spirit.